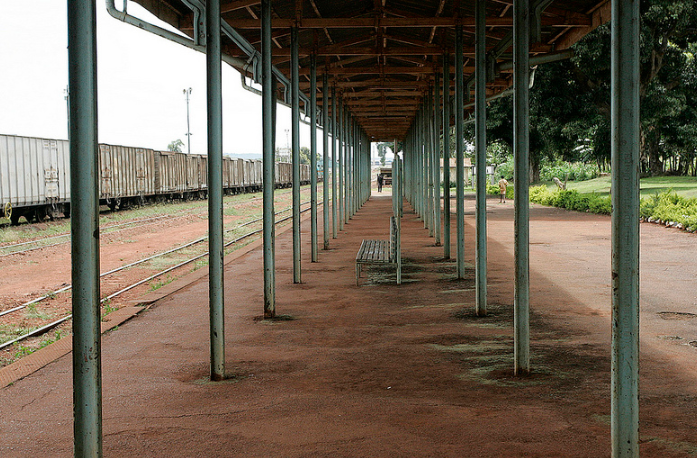 We start this next portion of the journey at Jinja Railway Station, Jinja sits on the northern shore of Lake Victoria, near the source of the White Nile. 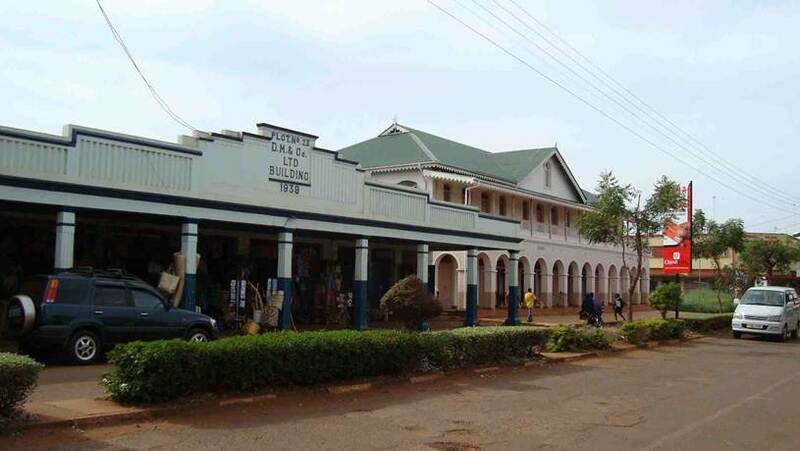 Lonely Planet says that Jinja is “famous as the historic source of the Nile River, Jinja is now the adrenaline capital of East Africa. 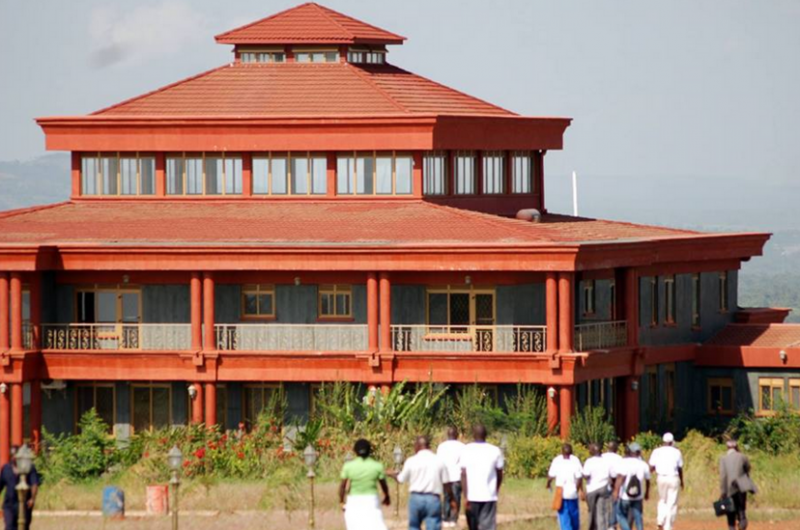 Get your fix of white-water rafting, kayaking, quad biking, mountain biking and horse riding in a gorgeous natural setting with crumbling colonial architecture. 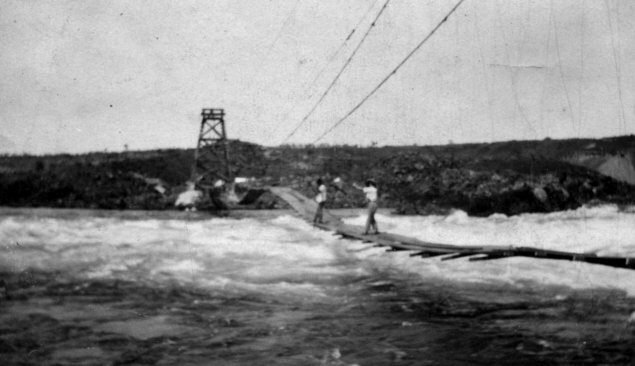 The Nile River’s world-famous rapids are under threat, however. 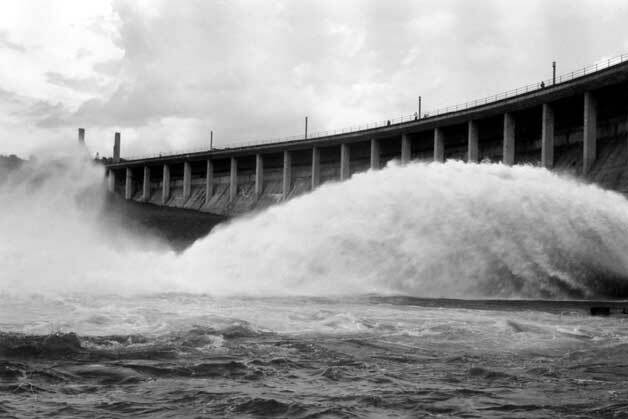 In 2011 the Bujagali Hydroelectric Project buried around half of the rapids under a giant reservoir. 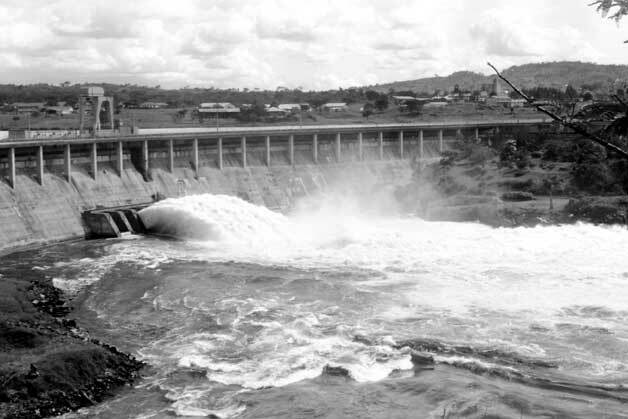 Although the government has pledged to not further dam the river, Uganda still needs energy and so a new hydroelectric plant is planned for Kalagala Falls. 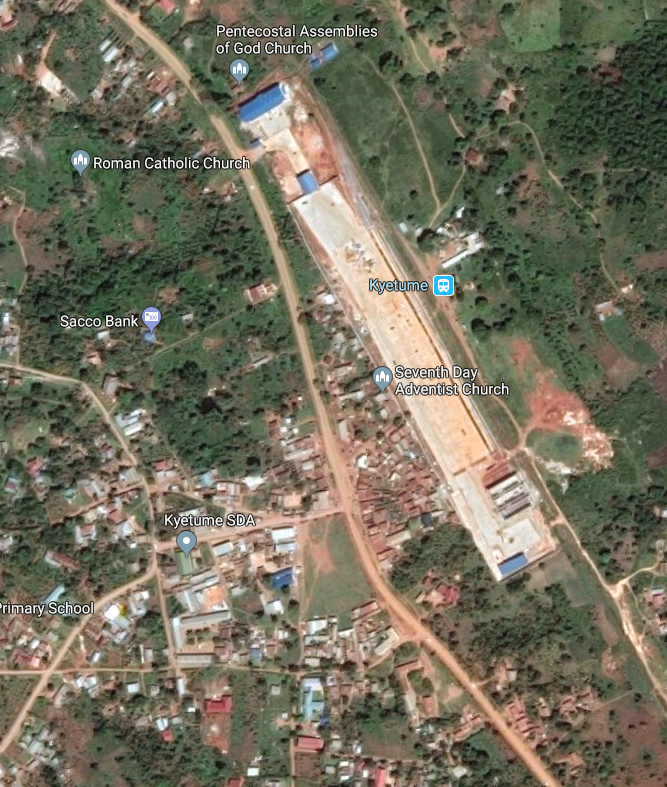 Though worker strikes and faulty construction have it behind schedule for now, it’s expected that the Isimba Dam will flood some key rapids and even an island lodging as early as October 2018. It’s not the end of rafting though. 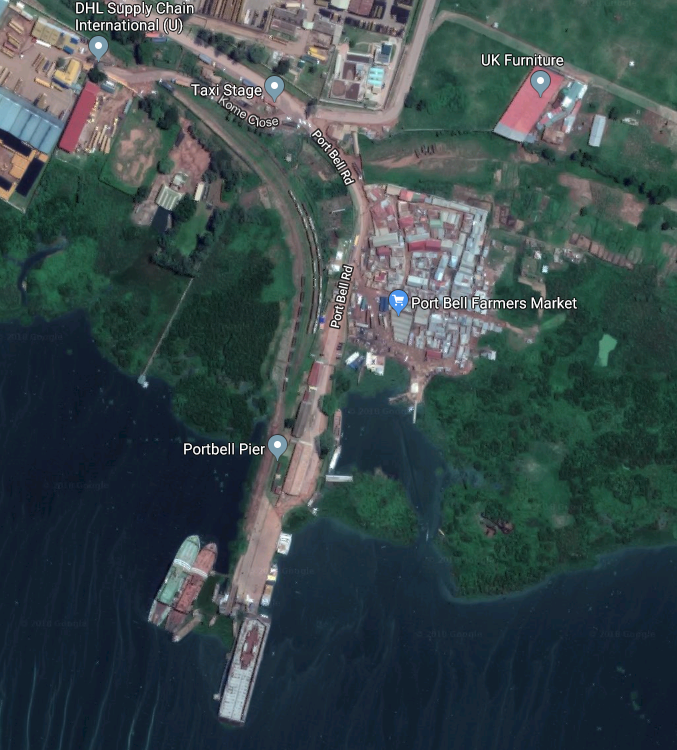 Meanwhile locals keep pushing to keep Jinja’s tourism industry alive with offerings that have wisely begun to diversify.”  Before 1906, Jinja was a fishing village that benefited from being located on long-distance trade routes. 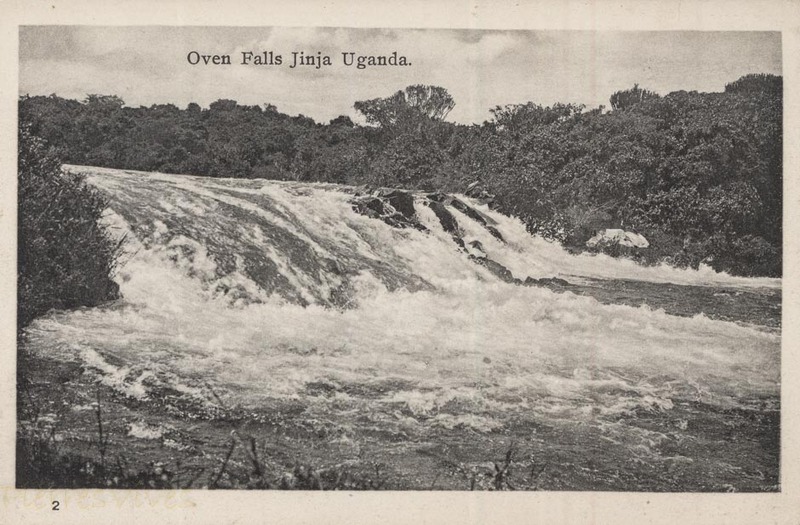 The origin of the name “Jinja” comes from the language of the two peoples (the Baganda and the Basoga) that lived on either side of the River Nile in the area. 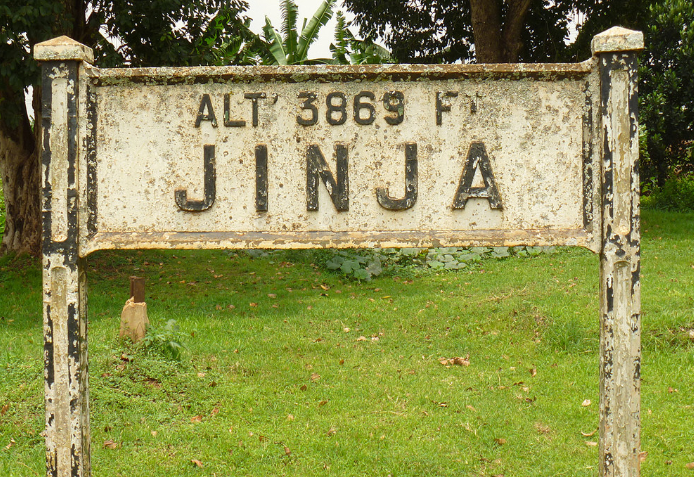 In both languages “Jinja” means “Rock”. 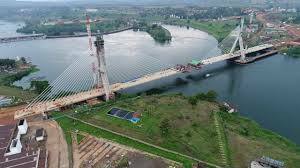 In most of Africa, rivers like the Nile hindered migration, this explains the ethnic boundaries along the Nile as one moves north from the river’s source on the northern shores of Lake Victoria. 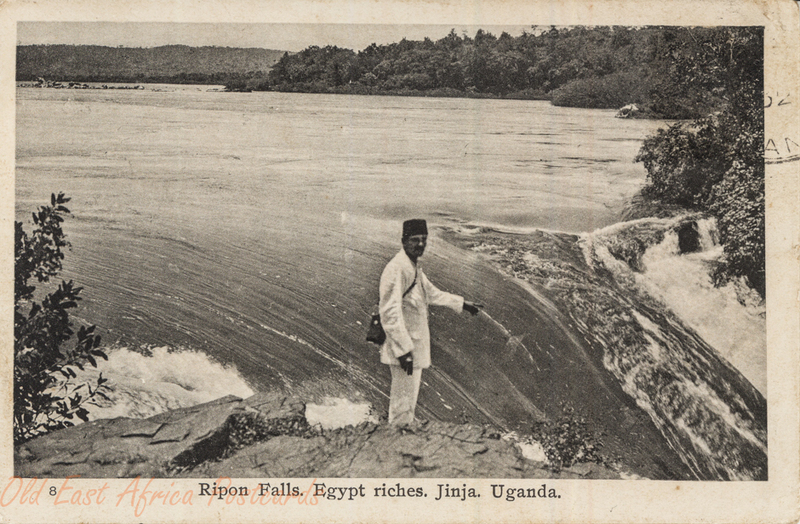 However the area around Jinja was one place where the river could be breached due to the large rocks near the Ripon Falls. Here, on either bank of the river, were large flat rocks where small boats could be launched to cross the river. These rock formations were also accredited with providing a natural moderator for the water flow out of Lake Victoria. 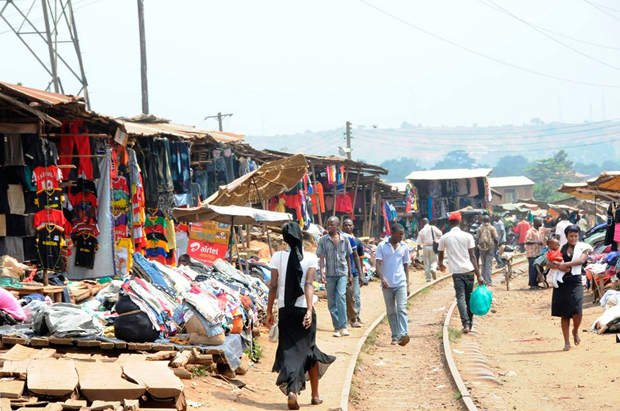 For the original local inhabitants, the location was a crossing point, for trade, migration and as a fishing post. 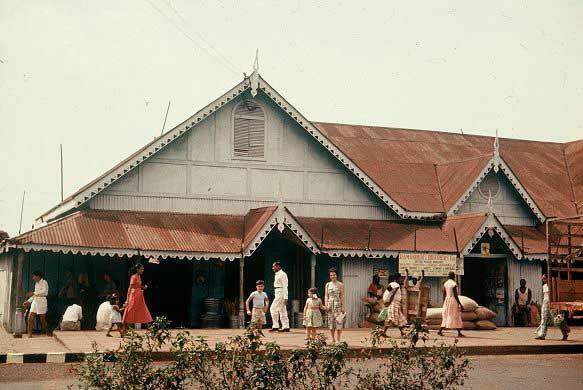 Cotton-packing, nearby sugar estates, and railway access all enabled Jinja to grow in size. 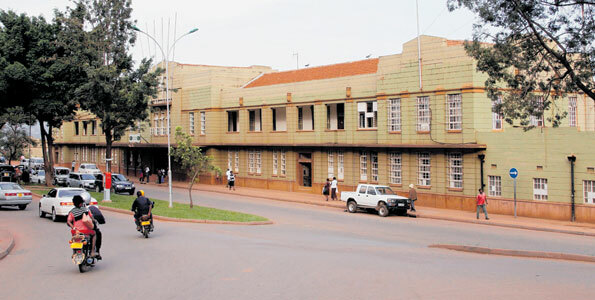 By 1906 a street pattern had been laid out, and Indian traders moved in starting around 1910. 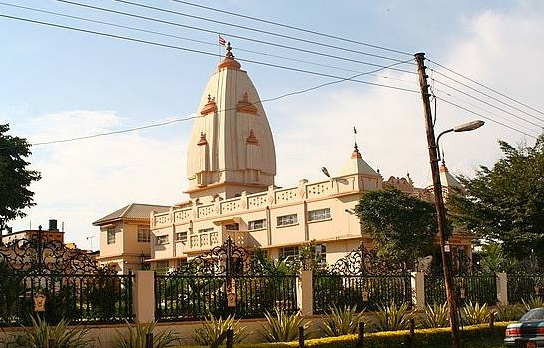 The Indians were Catholic Christians and English-speaking, and originated in the former Portuguese colony of Goa on the west coast of India. 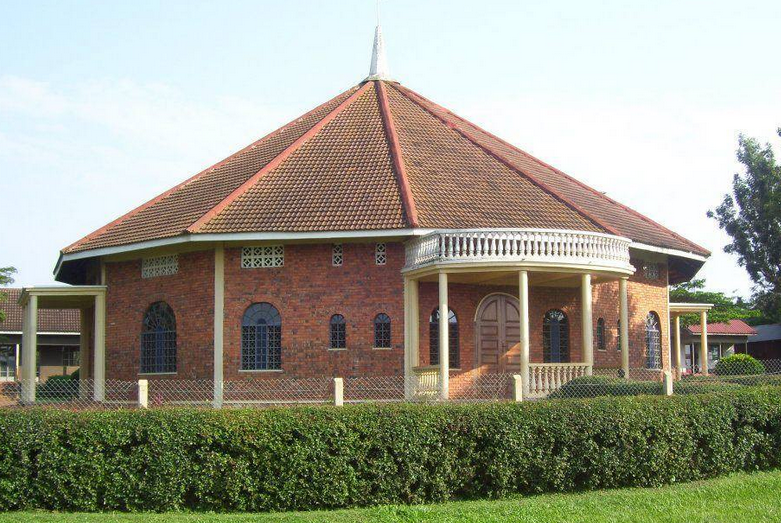 Before we get on our train, here are a few pictures from Jinja, taken in different eras and culled from a variety of different websites. Ripon Falls Ripon Falls Hotel Owen Falls Owen Falls Dam in the early 1960s. 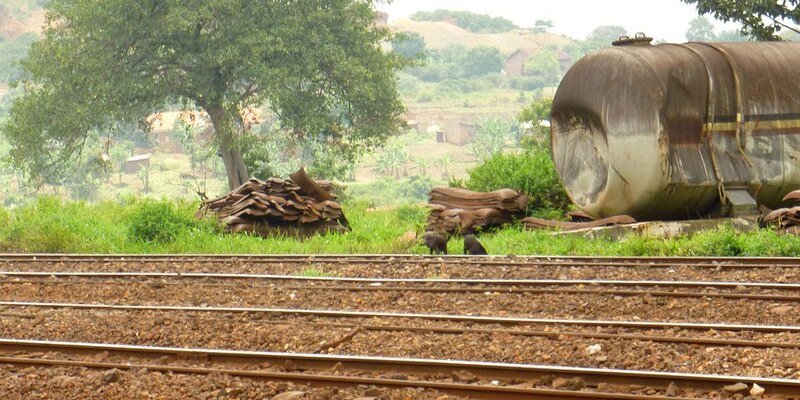 As we leave Jinja Railway Station, we cross unmetalled roads and head on towards the Victoria Nile. 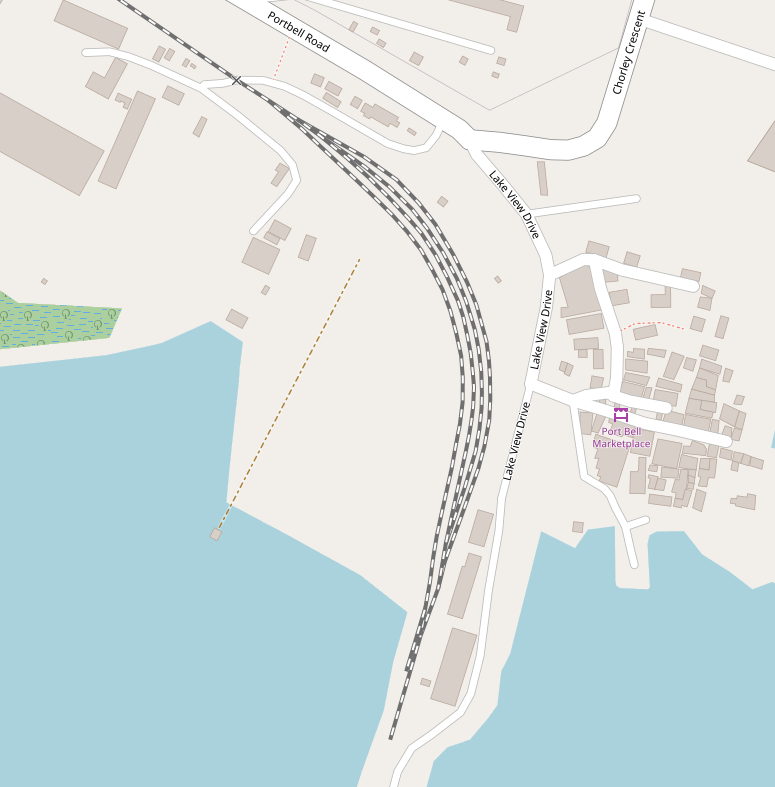 On the way, close to the Station throat, we pass two branch-lines, the first travels east and is no more than a factory access to the railway system. 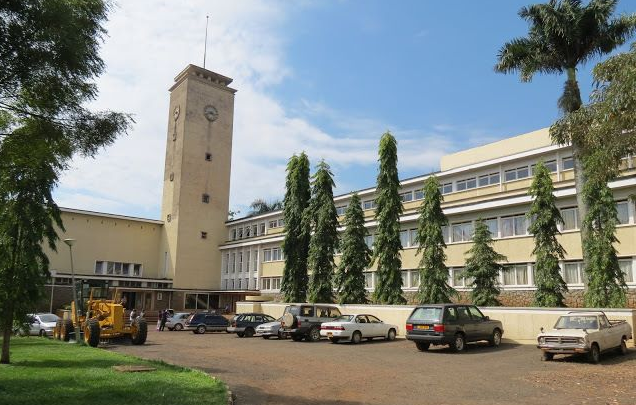 The second travels south alongside Nile Crescent to sidings and a pier on Lake Victoria. 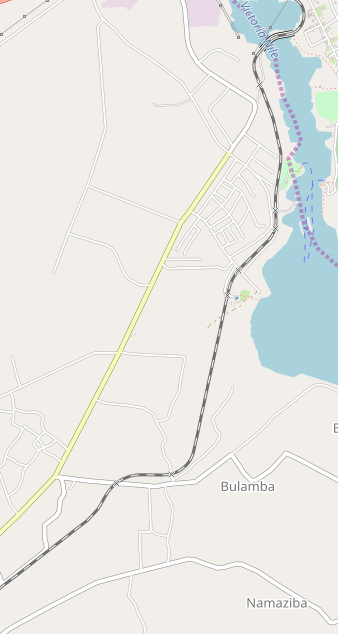 On the map immediately below, the main line turns to the west. 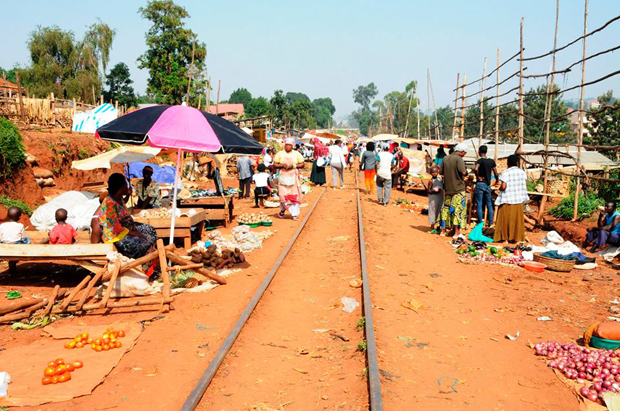 In a very short distance the line switches to the south and heads directly for the Nile Bridge. 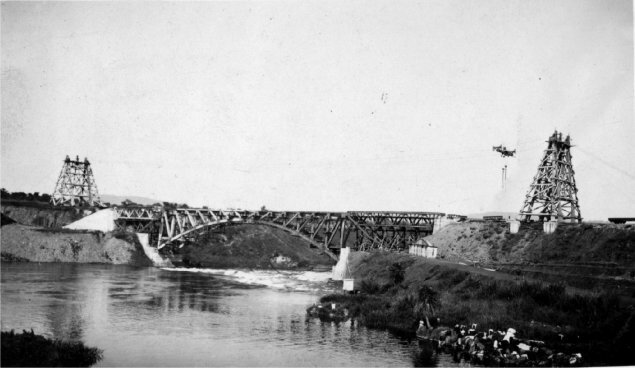 A sharply curving alignment of the railway approaching the bridge from the east shows it in good light. 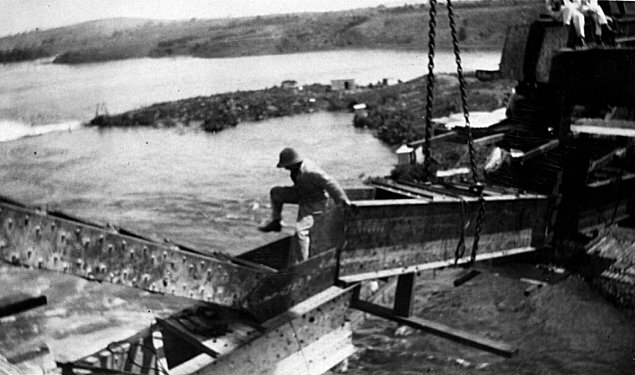 The Nile River Bridge at Jinja was built in the late 1920s. 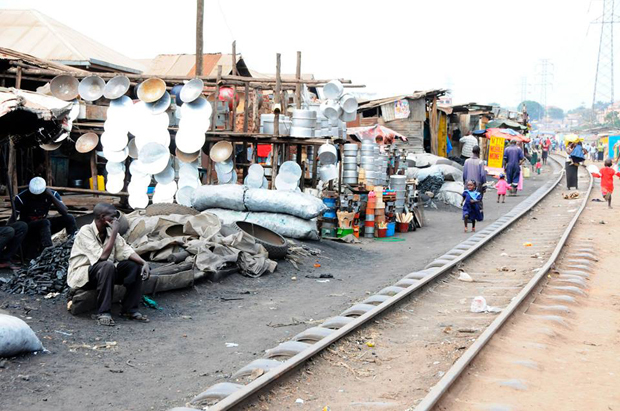 It is perhaps the iconic structure for the whole of the metre-gauge railway system from Mombasa to Kasese. 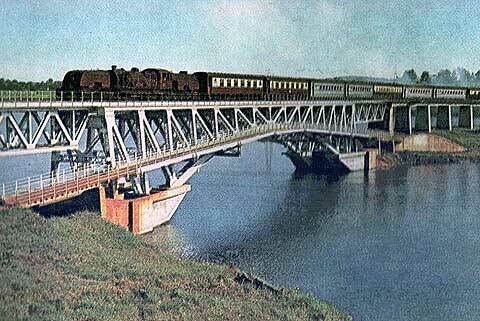 The first railway in Uganda ran from Jinja to Namasagali on the Victoria Nile where a steamer service ran on to Masindi Port. 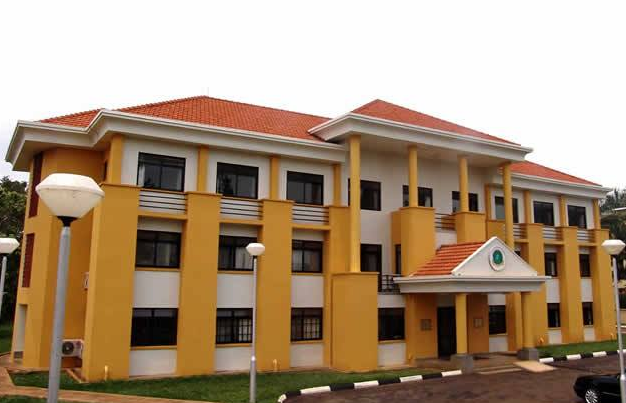 From there passengers travelled by road through Masindi to Butiaba on Lake Albert. 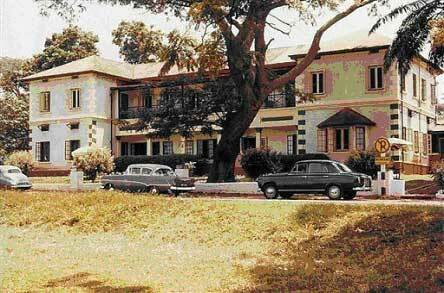 From there they could travel on by steamer to the Belgian Congo or north to Juba in the Sudan. 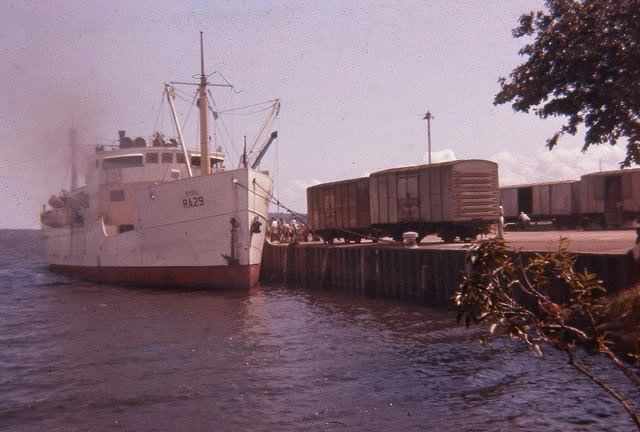 Train passengers from Kenya reached Uganda by steamer from the railhead at Kisumu and across Lake Victoria to Entebbe or Port Bell. 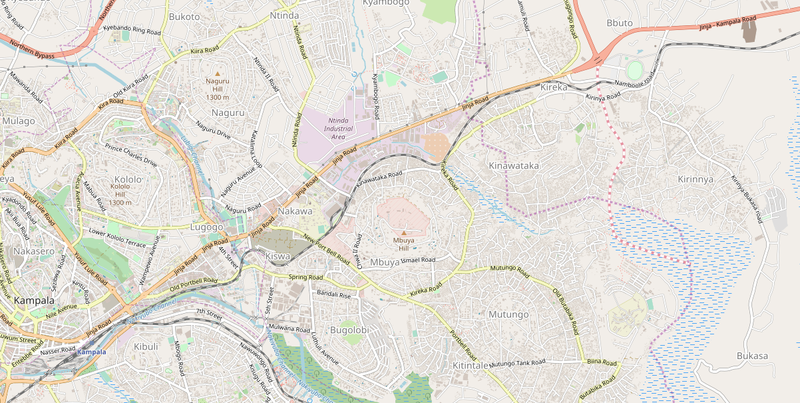 In the mid 1920s the main line in Kenya was extended from Nakuru through Eldoret, and Tororo to Mbulamuti where it met up with the original Jinja to Namasagali line. 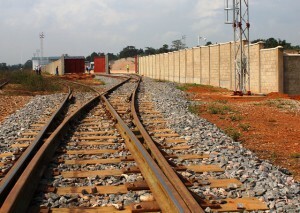 The new line to Kampala then crossed the Nile at Jinja by a bridge carrying both the railway and a roadway underneath. 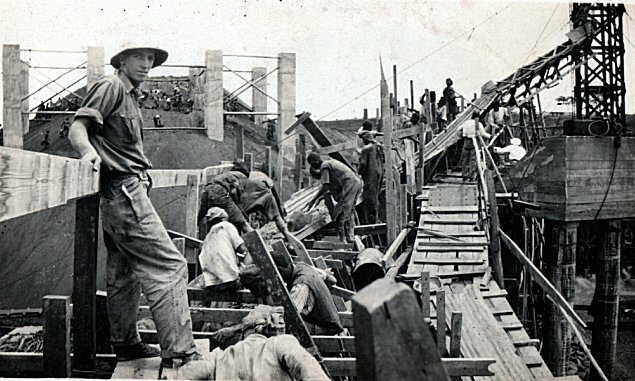 Ramsay Nicholson with the assistance of his younger brother Pearce Nicholson was responsible for supervising the construction of the bridge in 1926 and the following historic photographs were copied from their family’s photograph album in 2010. There are more in the album. 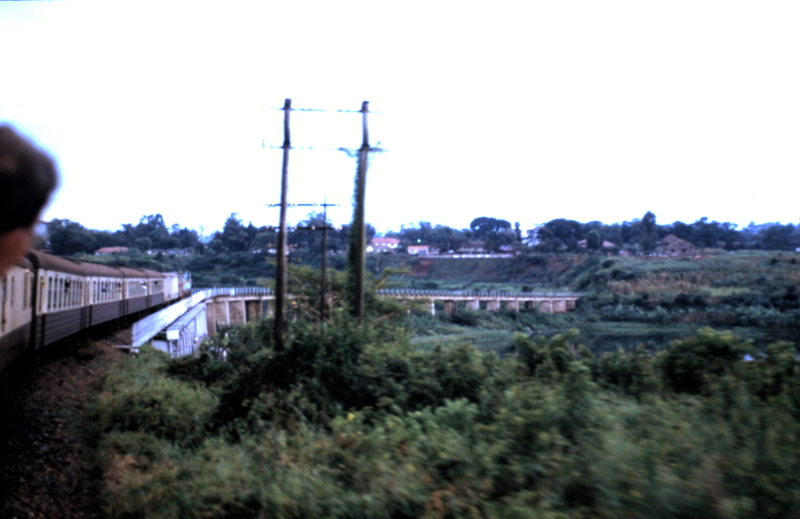 Both above and below (in colour) – looking east: Classic scene with Class 60 Garratt heading a Mail Train bound for Kampala over Jinja Bridge. 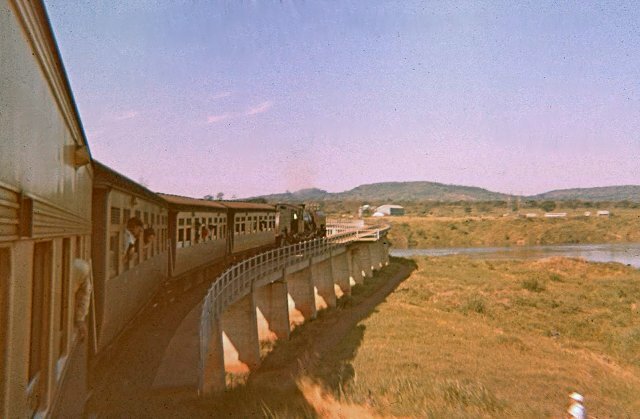 The photograph was taken after 1958 as the dining car (last vehicle in photograph) has acquired the all cream livery which was introduced after the Queen Mother’s visit that year when several of the the aluminium coaches were painted cream to give a uniformity to the royal train consist. 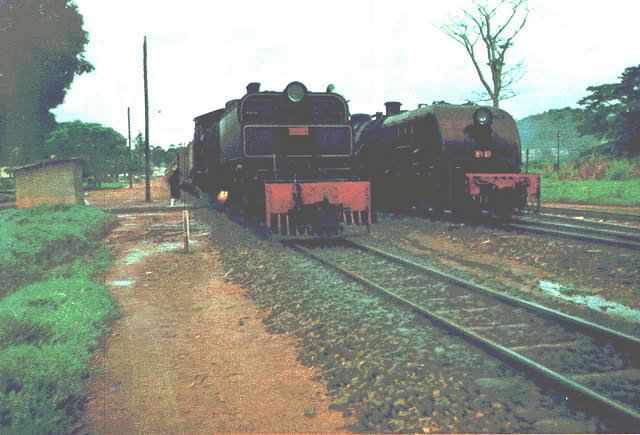 By 1961 all passenger coaches had acquired the dark maroon and cream livery which had previously only appeared on 2nd and 3rd class stock, (c) East African Railways & Harbours. 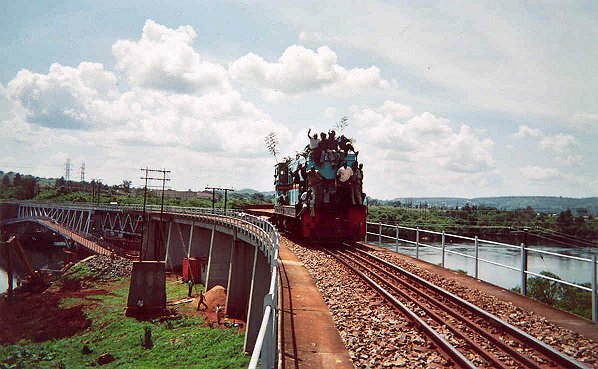 Again looking east, A diesel in charge of a train on Jinja Bridge. 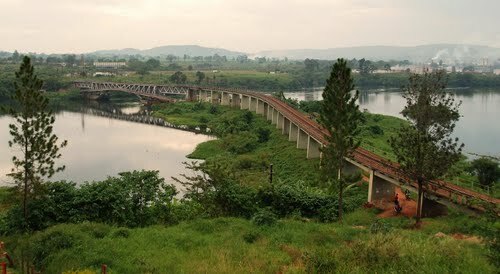 The Nile Bridge at Jinja looking west. 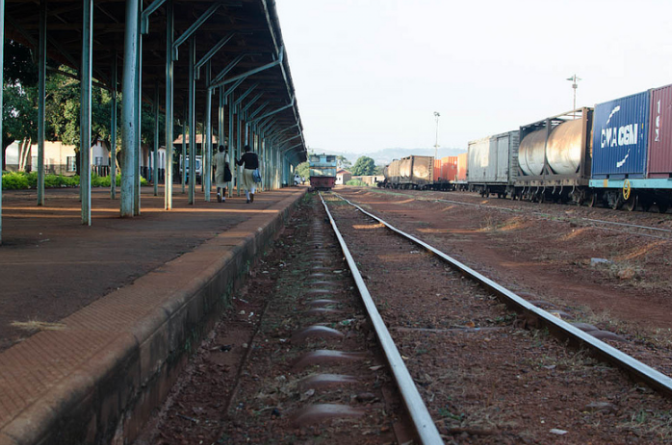 Jinja is still a very important railway centre with wagons being mustered for despatch by to Kenya – by rail via Tororo, or by rail ferry to Kisumu. 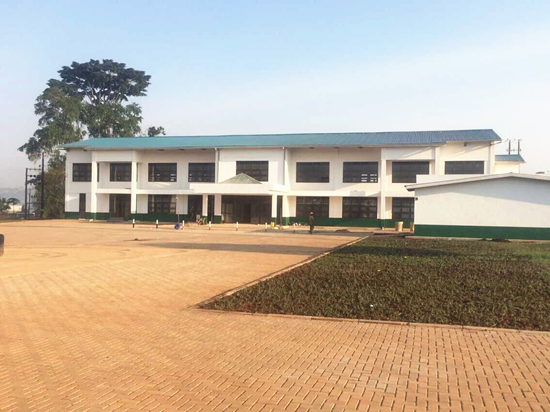 Another possible destination for the wagons is Mwanza in Tanzania. 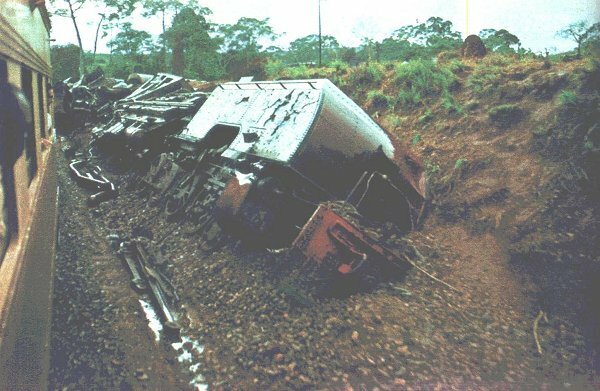 Vague about what decides a wagon to go by rail via TRO or by Lake via KSM or MWZ, but thought to be customer who decides, (c) Iain Mulligan. 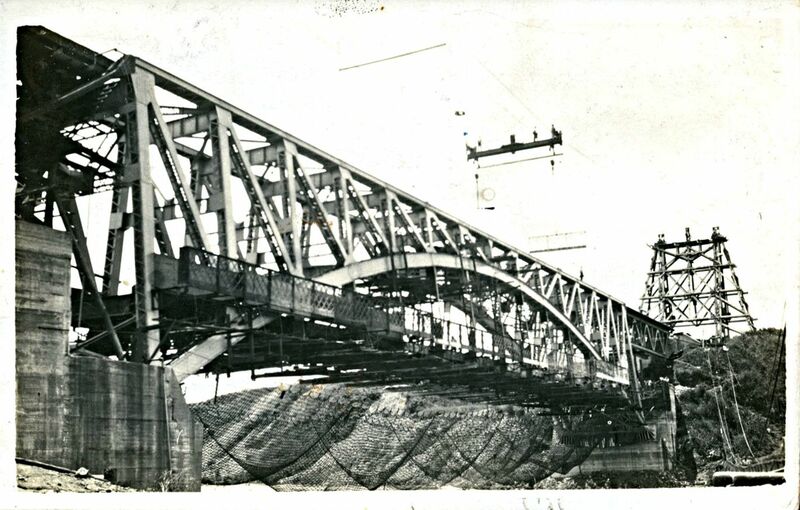 Again looking west, the photographer climbed up on to the Bridge and then walked back eastwards along the tracks. 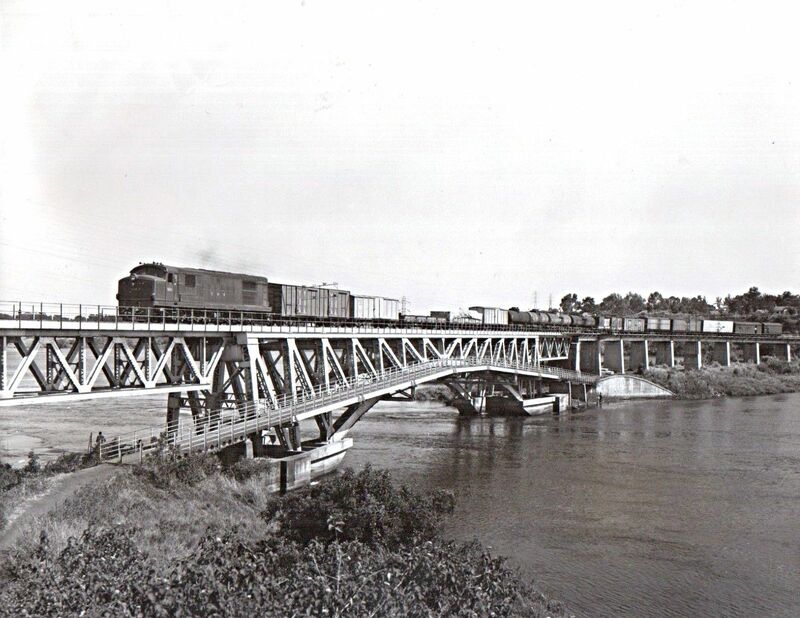 Once past the bridge itself, but still on the elevated approach, joy of joys, a “train” came over behind him. 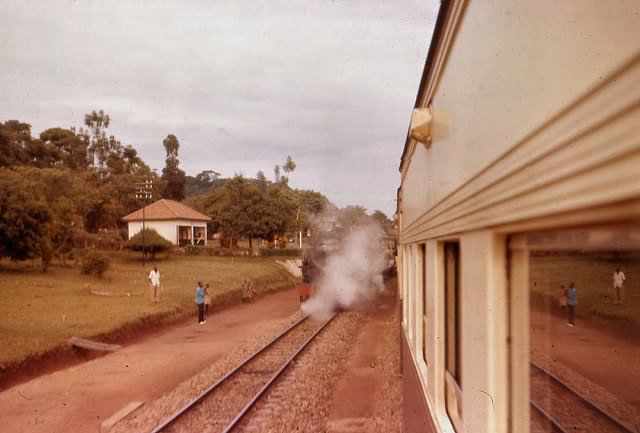 Not a real train, but the works train, and what that meant was a Class 62 decorated with palm leaves pulling a LSB, with a crowd of workers on their way from the stations to the west to a union meeting at Jinja. To the photographer’s horror the sides of the LSB were open flat, and there was only just room for him between them and the railings. Anyway, a great cheer from the passengers as they went past. (c) Iain Mulligan. 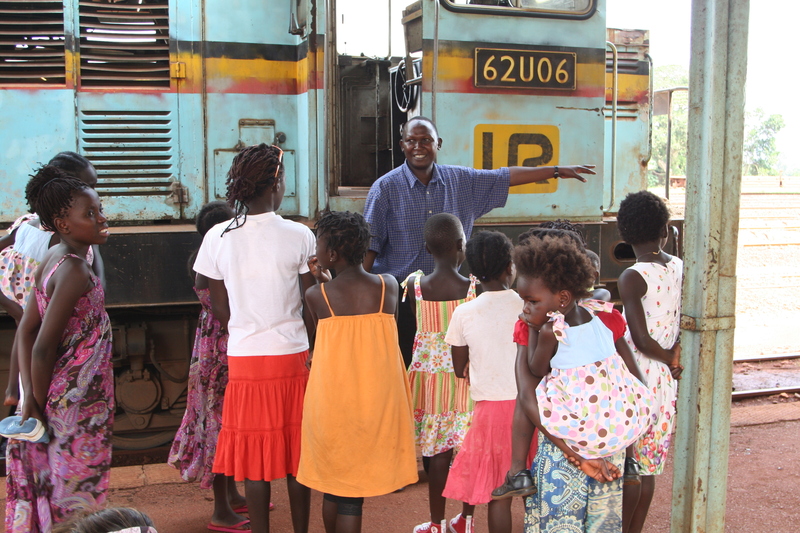 Happy days and homeward bound, the train is travelling toward Kampala. 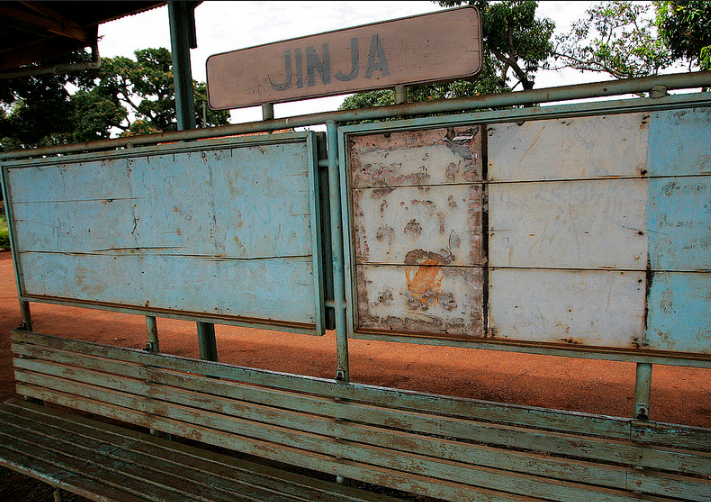 Most school pupils tended to get to a window for the crossing of the White Nile just after the train left Jinja. 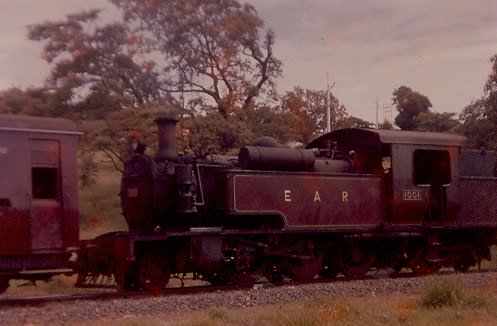 At primary school, many boys would carve “propellers” which they held out the window as the train went along at around 25 to 30 miles per hour, (c) Malcolm McCrow. 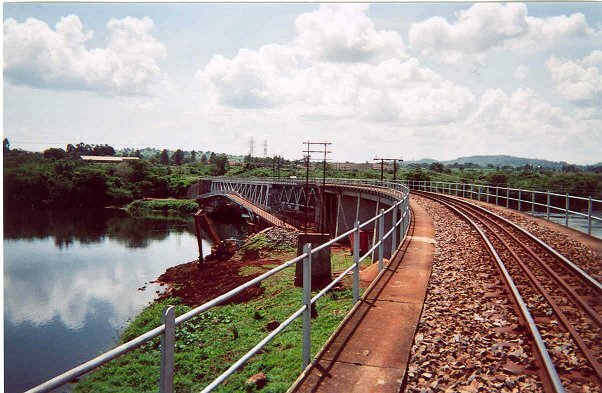 The Nile Bridge looking West in 1994. 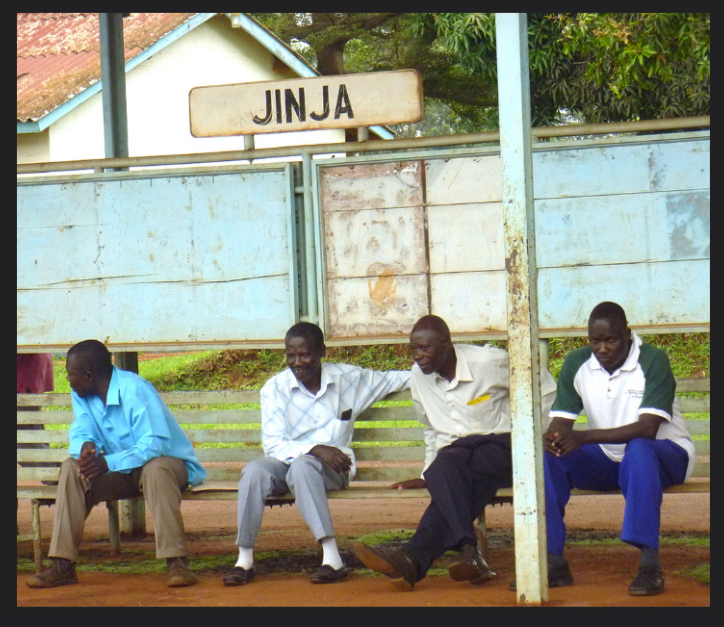 Our train has just moved on after a 6 hour delay at Jinja Railway Station. 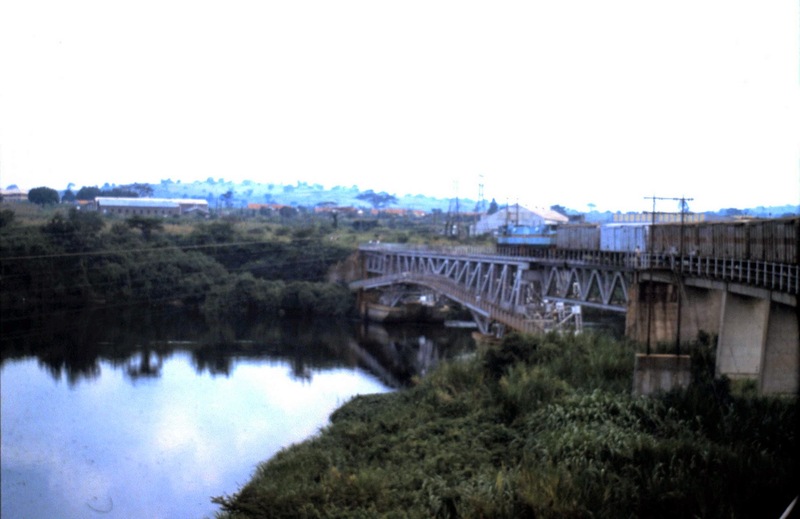 The Nile Bridge in 1994 looking east, on my return journey to Nairobi from Kampala. 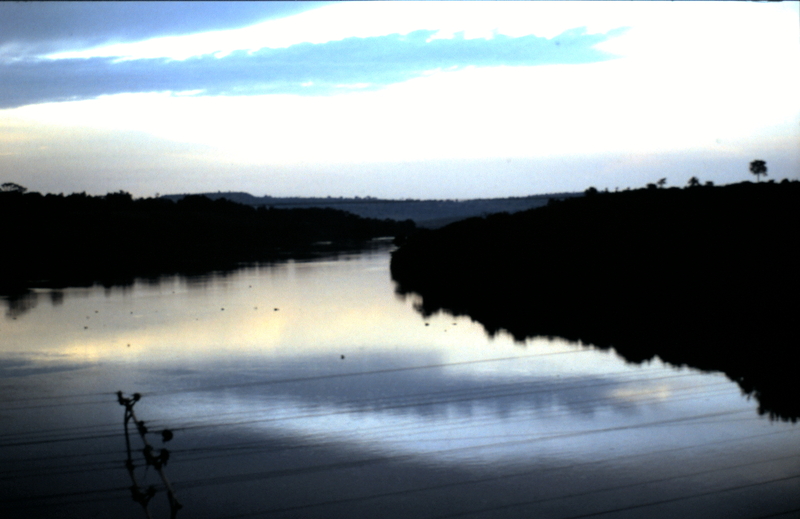 View from the Jinja Bridge at dusk in 1994. From a distance! 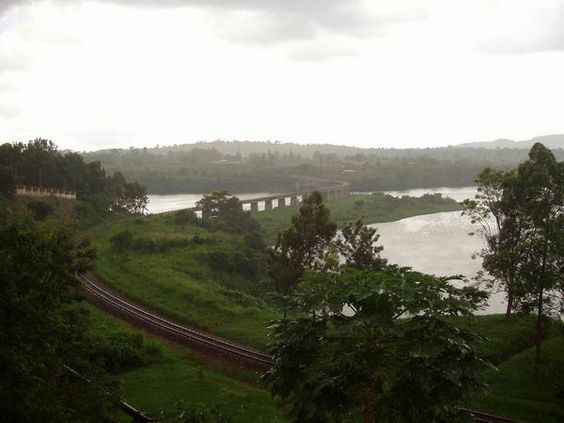 River Nile Bridge at Jinja looking west. .
Buikwe (Buyikwe): as far as I can tell, this is the first station/halt beyond Jinja Railway Bridge when travelling towards Kampala. 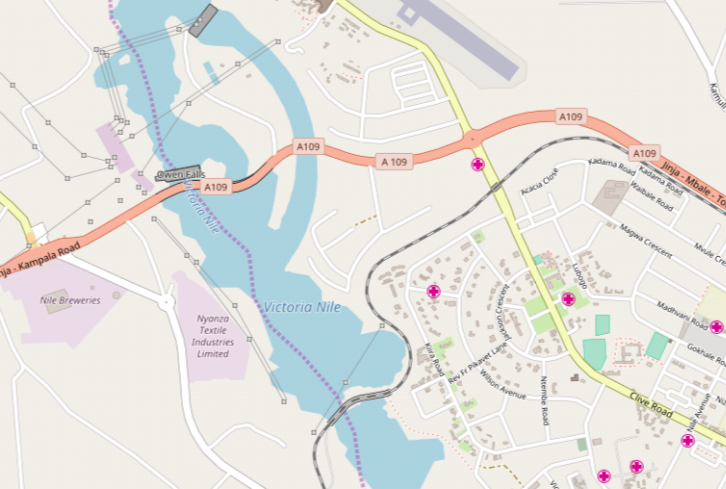 The first map and satellite image below show its location and I believe that it is likely that the monochrome picture which follows was taken at the Station in the early 1950s. 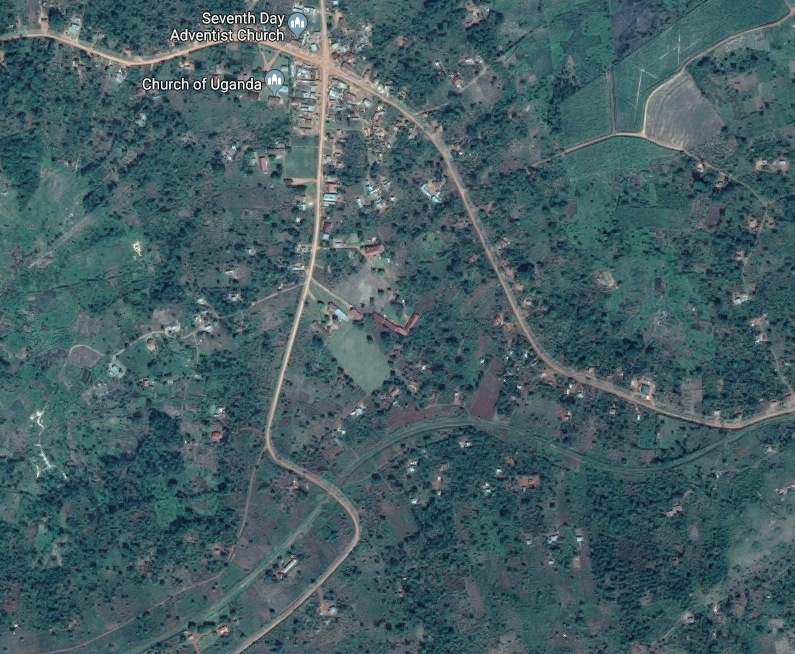 Lugazi/Kawolo: is 45 kilometres (28 miles) east of Kampala by road. 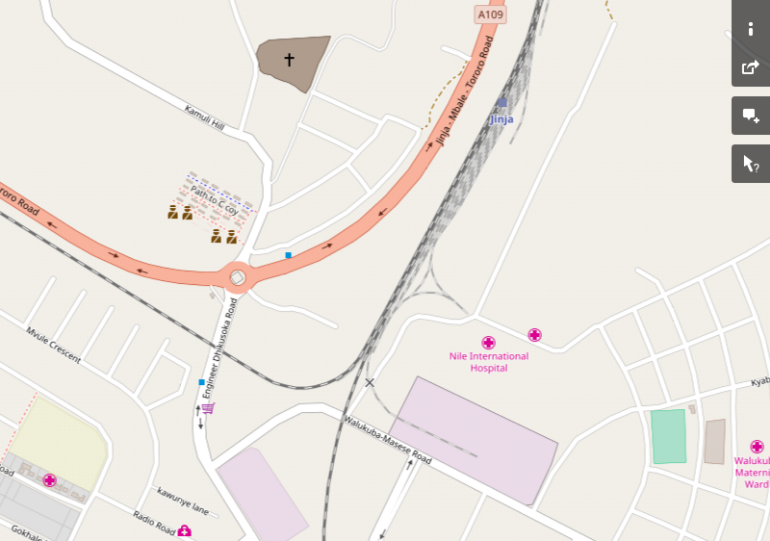 There is a Station close to the centre of the town as shown on the map and satellite image below. 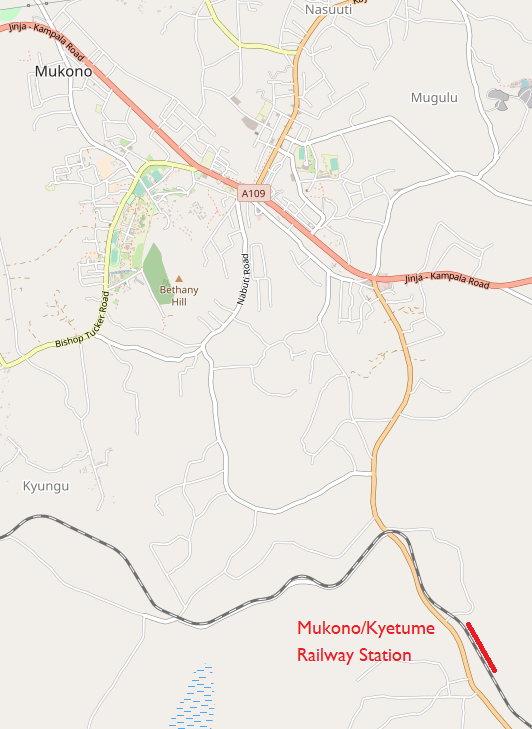 The Station also served the hospital at Kawolo which is shown on the map of Lugazi just to the east of the town. 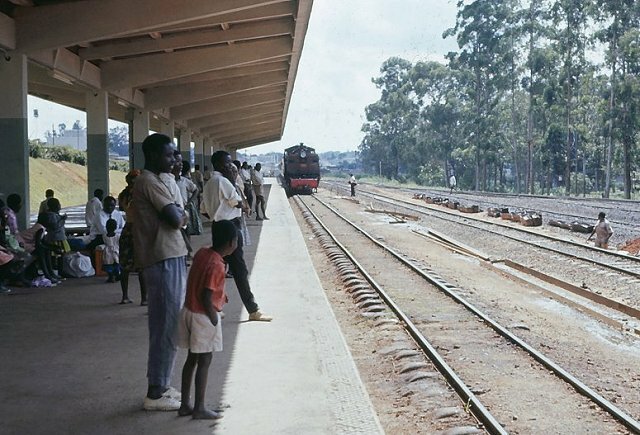 A Guide To Uganda” (Crown Agents, Curwin Press 1954) shows a Class 56 Garratt No. 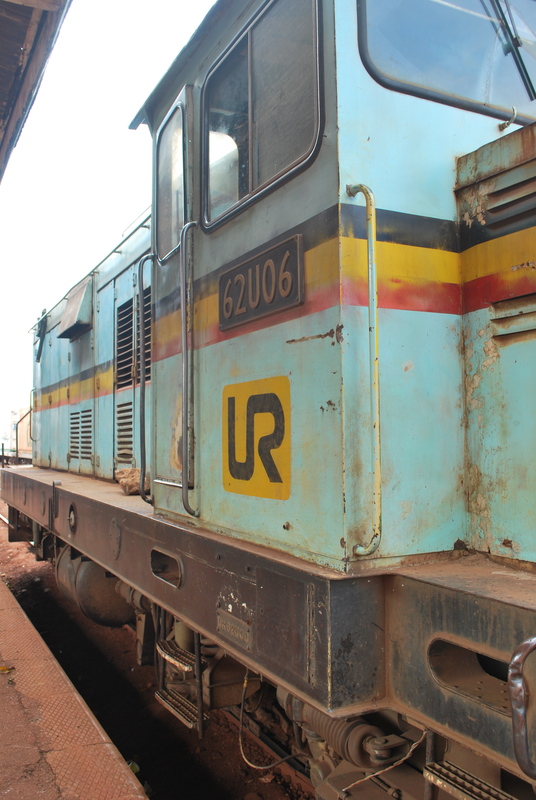 5603, at a station between Kampala and Jinja. 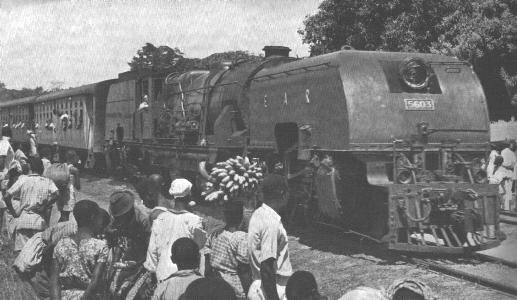 The 56s were replaced by the 60s in 1954-5, (c) East African Railways and Harbours. 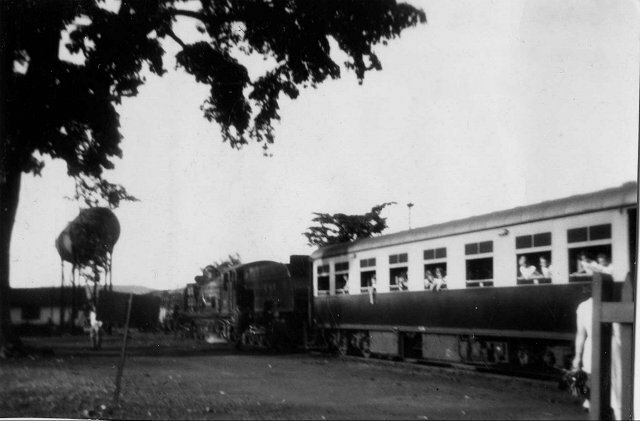 School Trains ran to the same schedule as the Mail Trains, but on days when the Mail did not run. 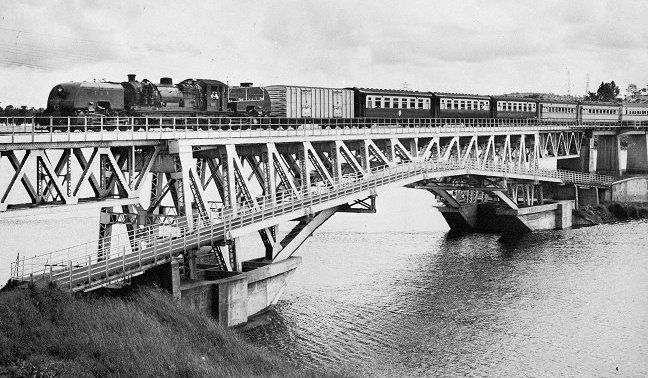 The consist was virtually the same, although there was often only one, or no first class coach at all, on many of the School Trains. 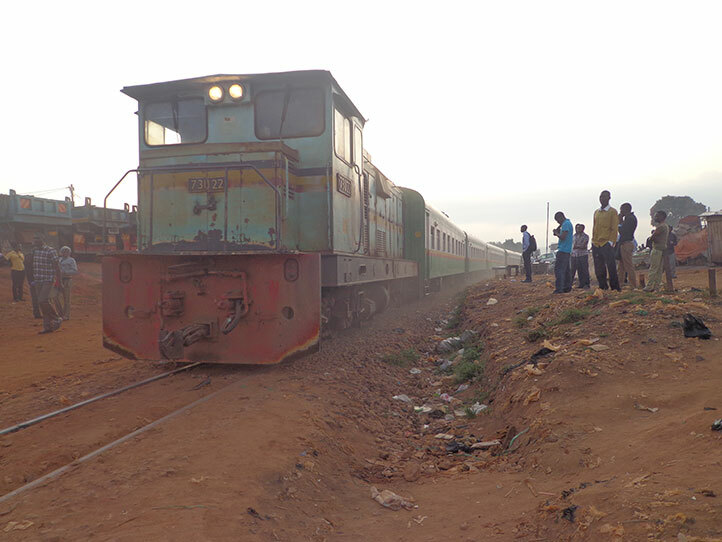 Here a Giesel ejector fitted Class 58 Garratt heads a Kampala bound Mail Train through Kawolo, 226 miles from Eldoret and 31 miles from Kampala. 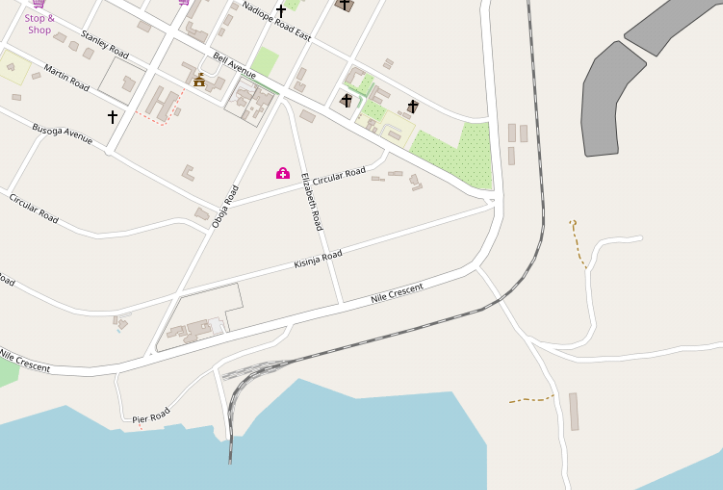 The oil fired furnace is clearly visible. 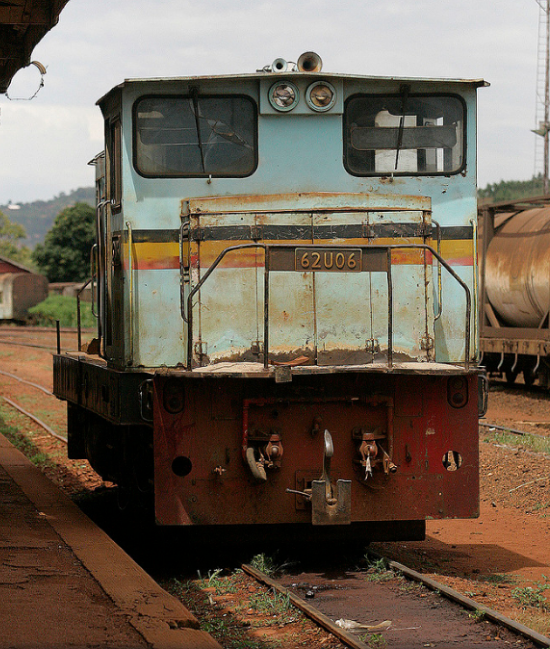 A Kampala bound freight is headed by a Class 60 Garratt still to be fitted with its Giesel ejector, © A J Hudson. 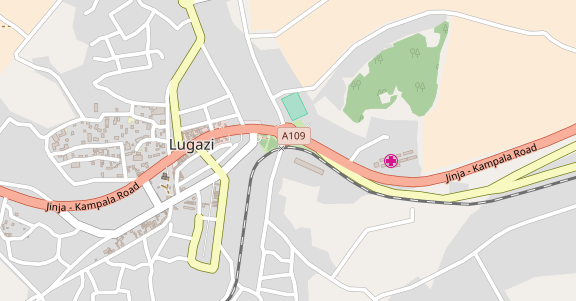 Lugazi Railway Station runs north-south near to the centre of the map above. 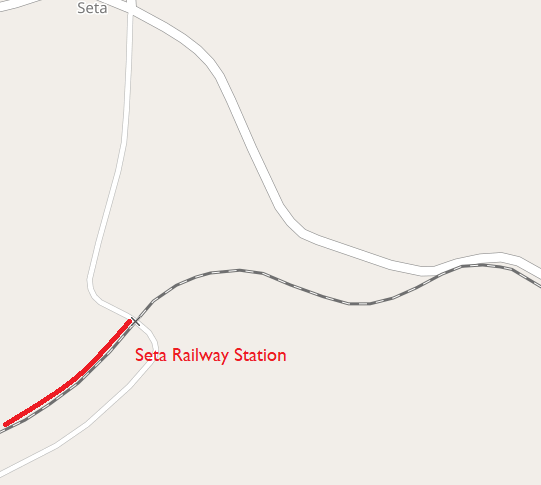 Seta: The next Station is at Seta. It was on the south side of the small village bearing the same name. 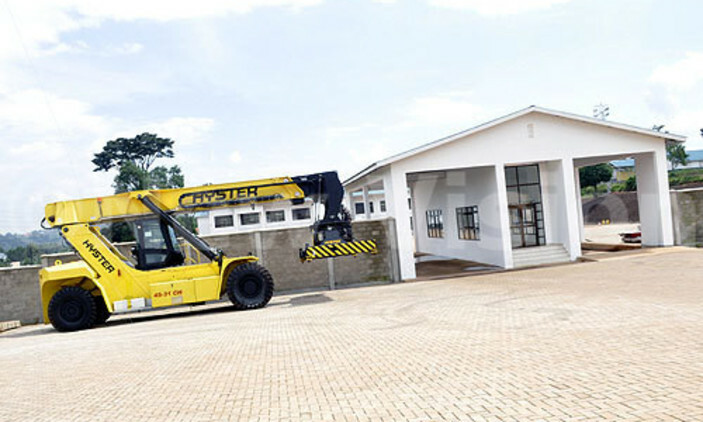 The ICD project was funded by World Bank and managed by the Ugandan ministry of works and transport in line with the East African trade facilitation program. The Editors of Encyclopædia Britannica (13 January 2014). “Profile of Lake Victoria, East Africa”, https://www.britannica.com/place/Lake-Victoria, accessed on 5th June 2018.
https://www.lonelyplanet.com/uganda/eastern-uganda/jinja, accessed on 5th June 2018.
http://jinja.go.ug/about-us/history-location-size, accessed on 5th June 2018.
http://www.jinjatours.com/guide/about-jinja.html, accessed on 5th June 2018.
https://bigeye.ug/photos-top-five-prominent-buildings-in-jinja, accessed on 5th June 2018.
http://www.mccrow.org.uk/eastafrica/eastafricanrailways/KampalaNairobi.htm, accessed on 1st June 2018.
https://www.pinterest.co.uk/pin/269793833897649501/?lp=true, accessed on 5th June 2018.
https://www.pinterest.co.uk/pin/262334747022488313/?lp=true, accessed on 5th June 2018.
http://www.mccrow.org.uk/EastAfrica/EastAfricanRailways/EARIainMulligan/UgandaRailways2004.htm, accessed on 5th June 2018.
https://www.flickr.com/photos/kibogroup, accessed on 5th June 2018.
https://www.flickr.com/photos/usarmyafrica, accessed on 6th June 2018.
https://www.flickr.com/photos/tattoodjay/3665215232/in/photolist-8MRSUk-8NcJGa-58QCkB-7WskKS-6Nb4iz-6zTbN5-6NfeEy-6Nfv75-7kW7Bn-6NbgBx-6PikUT-jZMK7-8NcJNn-8NfTXm-8NcNan-8NfSxN-8NfUeG-8NfSN7-8NfQvw-8NfQcs-8MRSbe-8MRTvg-8MRTXF-8NcPan-8NcNoH-8MUWHh-8NfRHG-8MUWkw-8MRUr6-8MUXxE-8MUX3h-8MRSGi-8MRSAr-8NcK9x-8MRSQB-8NcKra-8MUXTU-8MRS3R-oeQAKP-6NfBME-5wabK1-qvh1r1-F9UCe5-4iVME4-4BrXVg-4iVRBc-4iVMrH-4iZQP9-4iVMgx-me7Mrr, accessed on 5th June 2018.
http://www.mccrow.org.uk/EastAfrica/EastAfricanRailways/KURJinjaBridge.htm, accessed on 6th June 2018.
https://en.wikipedia.org/wiki/New_Jinja_Bridge, accessed on 6th June 2018.
http://english.cjic.cn/news/2015928/n5409763.html, accessed on 6th June 2018.
https://www.newvision.co.ug/new_vision/news/1331101/construction-usd86m-rail-icd-mukono-completed, accessed on 6th June 2018.
http://www.sakisizwe.co.za/services.html, accessed on 6th June 2018.
http://www.ugandaforum.org/Africa/Photos/Country/PicCountrypg3.htm, accessed on 6th June 2018.
http://www.theeastafrican.co.ke/magazine/Kampala-now-mapping-its-historical-buildings/434746-3053984-e1i9pz/index.html, accessed on 6th June 2018.
http://www.mccrow.org.uk/EastAfrica/EastAfricanRailways/EAR_GeoffPollard.htm, accessed on 6th June 2018.
http://www.mccrow.org.uk/EastAfrica/EastAfricanRailways/KampalaNairobi.htm, accessed on 31st May 2018.
http://observer.ug/news-headlines/44973-survival-for-the-fittest-as-kampala-train-gathers-pace, accessed on 8th June 2018.
https://www.redpepper.co.ug/govt-railway-line-evictions-to-continue, accessed on 8th June 2018. 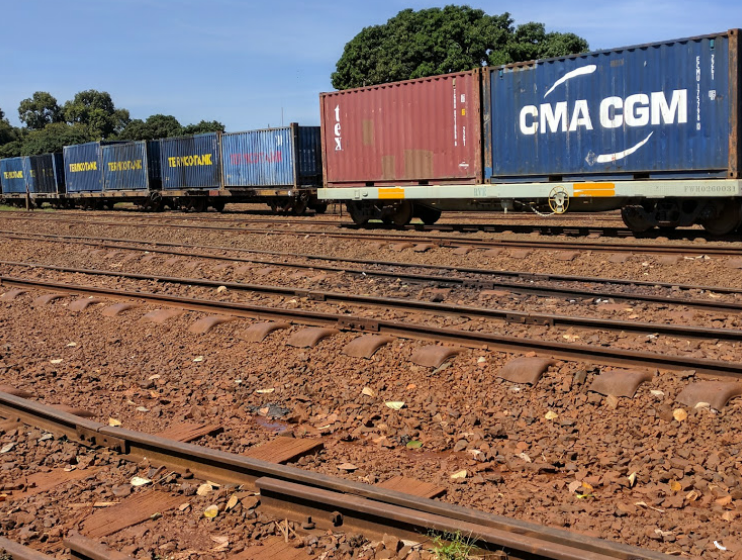 This entry was posted in Railways Blog, Uganda and Kenya Railways on June 7, 2018 by rogerfarnworth.